This article illustrates the different ways to end a SecureVideo session, if using the VSee platform. How do I change the size of my video tiles? 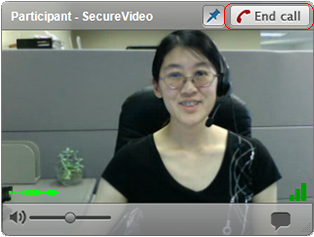 How do I start or enter a videoconference session? We recommend using the following instructions to end a session, to ensure that the connection closes promptly. While a connection will eventually time out, having an open connection will prevent you from starting another session. 1. Use the "Disconnect Session" button along the bottom of your Dashboard, or the waiting room page. On a Windows computer, you can also use the "End Call" button in the upper right-hand corner of the other person's video window. If you just close the program instead, you will need to wait for the connection to time out, or manually end the process, before connecting to a new session. 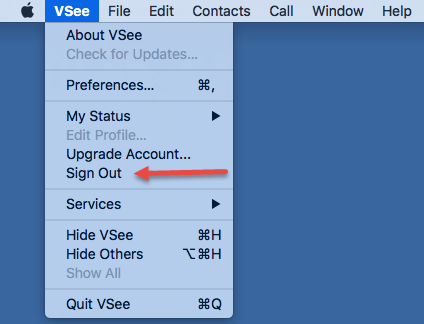 On a Mac computer, you would click on "VSee" in the upper left-hand corner of your computer screen (next to the apple icon) and select "Sign Out" from the dropdown. "Sign Out" closes the connection. If you choose "Quit VSee" first, the program will close, but the connection will not, and you will not be able to connect to a new session unless you end the process. 1. Tap on the bottom of the screen. This article was last reviewed by our Support team on July 3, 2016.